Tucked high in Vietnam’s remote northern mountains, close to the Chinese border, the former French military outpost of Sapa offers some of Vietnam’s most colorful experiences. Vietnam’s highest peak, the 3,143-metre Mount Fansipan, looms over the surrounding valleys, which feature terraced rice paddies and blazing green fields cut by fast-flowing streams. Layer upon layer of green ridges fade into the distance, edged by sharp, rocky peaks. The region is home to several ethnic minority groups, all wearing their traditional and colourful attire. After breakfast and short morning break and have some last preparation for the challenging hike. 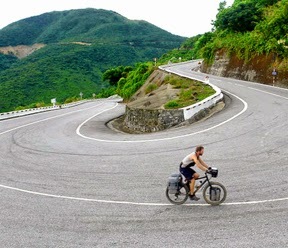 Depart at 900 AM toward the Silver waterfall then drive further to the Heaven Gate, the highesst peak of roads in Vietnam. From here you can see Fansipan , the highest peak of Indochina. We carry out trekking for e few hours until reaching lunch stop at a nice spot .From here the trek is up and down towards the campsite . En route you will have many opportunities to admire the stunning scenery and panoramic view of Sapa and Lai chau province. Arriving the site of 2900 meters in the late afternoon where we stay for the night. After breakfast ,We continue climbing to the top where you can celebrate the victory of life.After enjoying the best view of Indochina we sart trekking down.Stop on the way for a picnic lunch.From here the trail is tough as we are making our way down hill through the rain forest .This part requires more concentration on every step until reaching the campsite at 2.700 meter.We spend another night here. After breakfast,we continue making our way trekking downhill and stop on the way for lunch before reaching Sin Chai village where we make another break until we get collected by our vihicle back to Sapa where we bid farewell to our porters.Overnight at the Hotel in Sapa . Free at leisure to visit the town of Sapa until driving to Lao Cai for the night train back to Hanoi. Upon arrival at Hanoi Station you will be transferred back to your hotel.Ending of service of the Adventure Tour at the hotel.